Japan, one of the world’s most resourceful countries of metal, produced silver, equivalent with one-third of the entire output, at some time in Edo period, and in the second half of the 17th century, it topped the world in copper production. Osakaya was engaged in mine management at various locations of Japan, and they developed raw copper locally and then shipped them to Osakaya main store in Osaka, by taking a sea route. According to the record of 1708, they produced copper of 2.16 million kilo grams or 21600 tons, at their Ani dozan(copper mine), owned by Akita domain. This figure was equal to 700,000 koku in rice value. Copper mines were concentrated in the Tohoko district, especially in Dewa province, now known as Akita prefecture. Copper, produced in Ani, Akita, was shipped along Yoneshirogawa River to Noshiro port, where it was unloaded from a small boat and loaded onto Kitamaebune, a major cargo boat. Then it was once again landed at Echizennokuni Tsuruga, now known as Tsuruga-shi, Fukui, and put in a small boat. Going south along Lake Biwa, and then through Otsu, it was finally shipped to Osakaya, which was located in the center of Osaka. One package contained raw copper of 16 kan, equal to 60 kilo grams, and a boat of copper was 2,000 such packages. Akita domain imposed the shipping tax on Osakaya, and it was silver of 5 monme 4 bu per package. 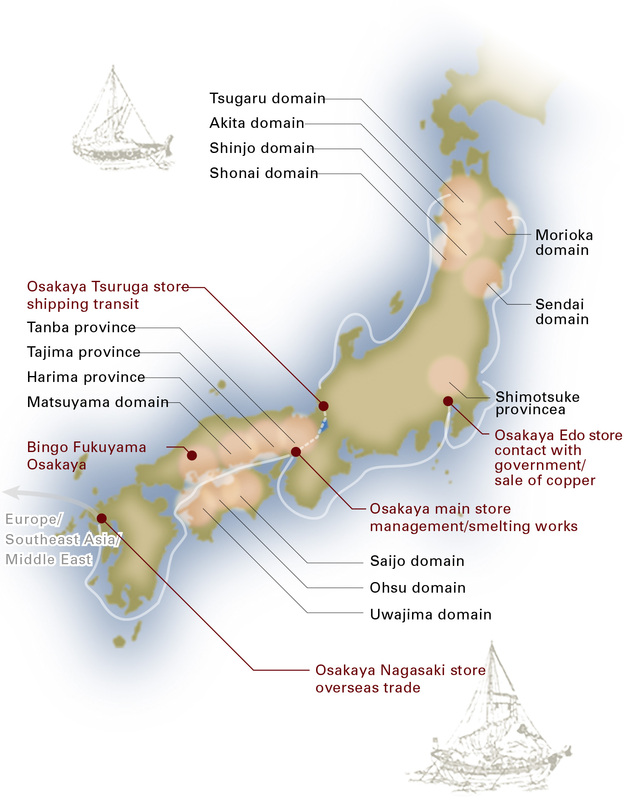 Copper ores were shipped to Osakaya’s main store from nationwide, which were smelted to be copper poles. Copper contains a small amount of silver and the method to extract silver by means of lead, was called “nanbanbuki”, which was the state-of-the-art industry of the world, and introduced from the western nations. Nanbanbuki required financial background and high skills, and only “goyosho” (merchant who was authorized by the government) were allowed to use this method. Among others, No.1 Sumitomo and No.2 Osakaya made a huge profit in this industry. After silver was extracted, copper was shipped to Edo, and sold as local copper at Osakaya’s Edo store, or exported via their Nagasaki store. Copper poles were sent to Europe, China, Southeast Asia, India or Arabian Peninsula, by Dutch ships or Chinese ships. Most of the purchase of merchandises from overseas were offset by sale of copper, and so such copper was called “Nagasaki kaido” or “Nagasaki goyodo”(copper sold to foreign countries in exchange with imported goods). In 1716, Akita domain’s “Nagasaki kaido” was 1.02 million kilo grams or 12000 tons, which accounted for 37% of Japan’s total export. 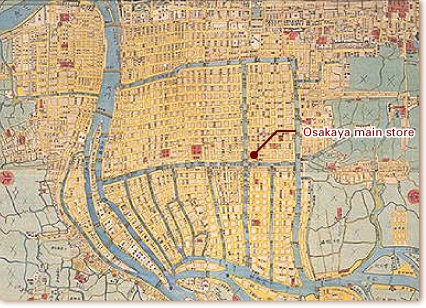 (revised version of drawing of Osaka area; national asset),owned by Department of Literature, Osaka University. Kaiseizouho Kokuho Osakazenzu(reviewed version of drawing of Osaka are; national asset), owned by Department of Literature, Osaka University.Osakaya’s Osaka main store was located in the direction of south-west of Yotsubashi bridge, and it was convenient for shipping transportation. The north of its property was facing Unagitanisuji, the south facing Daihoujichousuji, and west facing Yokoborigawa river. Along the river was called “Osakayanohama”(Osakaya’s seashore). Osakaya was located in Minamisenba, now known as Nishishinsaibashi, Minami-ku, Osaka-shi.